STEP 1: Rap the face with the small dot-this will knock the base pins away from the magnet. STEP 2: Spin the box to separate the two base pins, so the locking post can fall between them. STEP 3: Push the spring-loaded button to release the locking post, and slide the top off. There's your penny! Ny day job is medicine, and I strive to help my patients heal and ease their troubled minds. My hobby is making wooden puzzles to drive people nuts. This project is one of my favorites. The top won't budge, though, because it's locked in place. So the second task is figuring out how to unlock it. The steps for solving the puzzle are shown in the photos opposite. The secret to the locking mechanism is shown in Fig. 4. I divided the construction of the puzzle into two phases: building the body and creating the internal locking mechanism. I like to make the puzzle out of three different species of wood, with as much contrast as possible. You need to use clear hardwood for strength, because the narrowest part of each tail gets pretty thin. I glue up the two-piece top oversize, and when the glue dries I cut both top and bottom to their final thickness and length; the length has to be precisely 4 in. (See Fig. 2.) The final front-to-back depth will be exactly 3,5/$2» but f°r now I leave it oversize—around 4 V4 in. Next I rout the dovetails across the grain, using a 14° dovetail bit on the router table. To make routing easier, I first remove most of the waste by cutting a series of ^¿-in.-deep grooves on the tablcsaw. After you rout the dovetails, the top and bottom should slide together with very little friction. Then tape the top and bottom together at the sides and trim the front-to-back depth to exactly 3,5/32 in., removing any router tcarout. 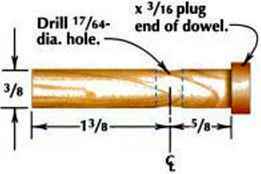 While the body is still taped, drill matching V^-in.-dia. holes in the front of the puzzle, plug them, and sand them flush. (See Fig. 3.) These plugs are your alignment marks for putting the puzzle back together. Now trim the body's four corners to j make the box hexagonal. With the top I and bottom taped together on all four : sides, mark the puzzle's body as shown in ? Fig. 3. Trim the corners on a power I miter saw, radial-arm saw, or tablcsaw. 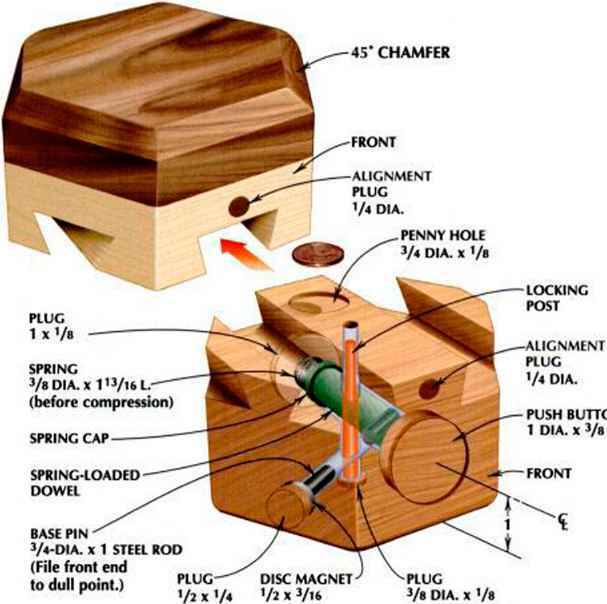 \ To be safe, clamp the puzzle to the fcncc \ or miter gauge. You can also temporarily J attach it to a fence with hot-melt glue. The top is made of two contrasting woods, laminated together. When you unlock the puzzle, the top and bottom slide apart along three parallel sliding dovetails. (See photos, opposite.) This drawing shows the relationship of the internal mechanism when the puzzle is unlocked. Figs. 2, 3, and 4 illustrate the major steps in the puzzlemaking process.